2017 is undoubtedly THE year of Latin Music and YouTube has played a critical role in allowing artists like Luis Fonsi, Daddy Yankee, Ozuna, J Balvin, Maluma and more reach the genre's widest audience ever. At the start of the year, only five Latin music videos had reached a billion views and today, that number includes 20 videos with over a billion views each. Summer smash “Despacito” was one of the biggest success stories of 2017 and the first (and still only) video in YouTube history to reach more than 4 BILLION views. A further example of Latin music’s marquee year on the platform is six of the top 10 videos released on YouTube in 2017 feature Latin artists. And, YouTube recently produced a documentary with Ozuna, one of Latin music’s biggest rising stars who had a breakout year with his debut album and currently has over 4.9 billion views across YouTube in 2017 alone. The explosion of Latin music is evident in the ever-growing list of pop stars collaborating with Latin artists, with videos featuring Beyonce, Justin Bieber, Fifth Harmony, French Montana, Chris Brown, Little Mix, Alesso, and Major Lazer all drawing in big views from around the world. 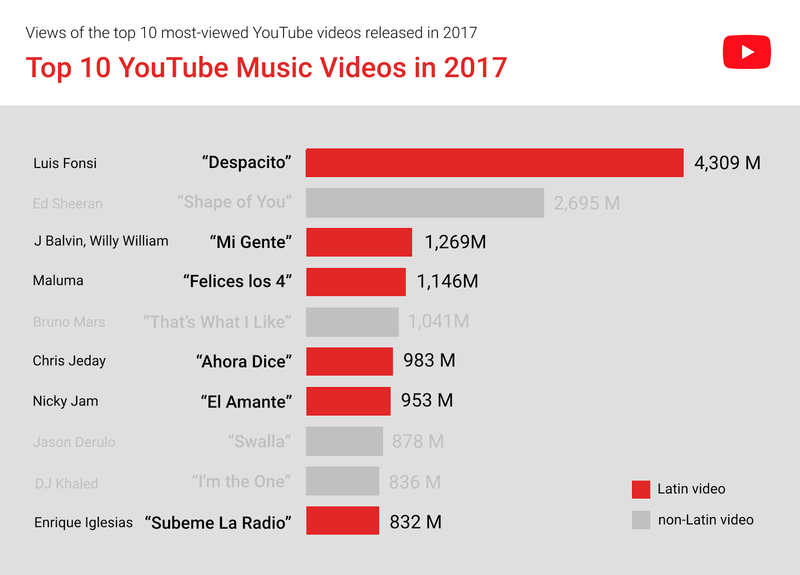 To demonstrate the explosive growth of Latin Music on YouTube in 2017, following are facts about how the genre crossed borders and reached a global audience. 45 of the top 100 most viewed music videos on YouTube this year feature Latin artists. Over 1/3rd of the tracks featured on YouTube’s weekly music track chart feature Latin artists. Over the last two years, daily views of the top 100 Latin artists on YouTube have grown over 75%. Around the world, daily view counts for top Latin acts have skyrocketed since this time last year, growing 316% in India, 268% in Indonesia, 257% in Philippines, 206% in Egypt, 150% in Israel, 120% in the United Kingdom and 116% in Australia. 1/4th of the top 100 most viewed music videos of all time feature Latin artists. “Despacito” was the first (and only) video in YouTube history to reach 4 billion views, in just 272 days. “Despacito” is currently the most viewed video of the year in over 50 countries, including Mexico, Germany, Portugal, Greece, El Salvador, Spain, Lebanon, Croatia and Italy. J Balvin and Willy William’s video for “Mi Gente” reached 1 billion views in only 102 days, becoming the 4th fastest in history to reach the milestone. “Mi Gente” has proven to be a global smash, seeing massive views in countries like the Mexico (298 million), United States (122 million), Brazil (54 million), France (26 million), the United Kingdom (16 million), India (9.2 million), Israel (6.7 million), Morocco (5 million), Australia (3.7 million), Thailand (3.3 million), Vietnam (1.9 million) and Japan (1.4 million). Shakira’s “Chantaje” has remained an international favorite this year, being amongst the top 10 most played song on YouTube in European countries like Portugal, Germany, France, Spain. Italy, Greece, Sweden and Croatia along with several Latin American countries. The video for the song reached 1 billion views in only 140 days, making it the 6th fastest to reach the milestone. As a sign of Latin’s massive year to come, “Chantaje” was the most played song on YouTube on New Year’s Eve of last year, earning 15.3 million single day views. Fittingly, the song earned the same distinction on New Year’s Day of this year. Shakira counts the United States, Italy, France, Spain, India, Turkey, Germany, the United Kingdom, Russia and Vietnam amongst her top 20 views drivers on YouTube. Leveraging his international reach, four videos featuring Colombian singer Maluma have now crossed the billion views mark. Outside of Latin America, he has received massive views in places like the United States (465 million), Italy (128 million), France (48 million), Germany (33 million), United Kingdom (29 million), Canada (22 million), Israel (20 million), Morocco (8.8 million), India (5.9 million), Japan (5.5 million), Australia (4.8 million), Thailand (3.8 million), South Korea (1.3 million). With over 2.2 billion views so far this year, 2017 has already been Ricky Martin’s biggest on the platform to date. Along with Latin American countries, The United States, Italy, Spain, France, Romania, Germany, Poland, United Kingdom, Portugal and Turkey make up the singer’s 20 top views drivers so far this year. While a global star all year round, Ricky Martin annually sees his biggest numbers on New Year’s Eve, where last year his views reached 14.8 million globally. The Latin explosion is not limited to Spanish speaking countries. Earlier this year, “Sua Cara” -- Brazilian artists Anitta and Pabllo Vittar’s collaboration with Major Lazer -- earned more likes in its first 24 hours on the platform than any other music video had in the history of YouTube. The video also earned 20.1 million views in its first 24 hours, making it one of the top 10 YouTube music video debuts of all time. The billion views counts are happening in record pace for Latin videos this year. Luis Fonsi - Despacito ft. Daddy Yankee, J Balvin, Willy William - Mi Gente (Official Video), Shakira - Chantaje (Official video) ft. Maluma, Maluma - Felices los 4 (Official Video), Ricky Martin - Vente Pa' Ca (Official Video) ft. Maluma, CNCO - Reggaetón Lento (Bailemos), Daddy Yankee - Shaky Shaky | Video Oficial are now amongst the top 25 fastest videos to reach the milestone. Latin American exports have racked up massive views in Spain, with Shakira, Luis Fonsi, Ozuna, Maluma, Bad Bunny, J Balvin, CNCO and Nicky Jam currently ranking amongst the top 10 acts in the country this year. Global views for Latin artists continue to reach new heights, with acts like Shakira (6.4 billion), J Balvin (4.6 billion), Nicky Jam (3.9 billion) Bad Bunny (4.2 billion), CNCO (4.2 billion), Ricky Martin (2.2 billion), Pitbull (1.7 billion) and Wisin (1.5 billion) racking up massive views in every corner of the globe. Reggaeton standout Bad Bunny has already reached 4.2 billion views across YouTube this year, a 1090% increase from last year. He is currently the #1 act this year in his home country of Puerto Rico, the birthplace of his distinctive sound. With mega hits by Luis Fonsi and Daddy Yankee, J Balvin, Maluma and more reaching the genre's widest-ever audience this year, Latin artists are helping reshape culture.